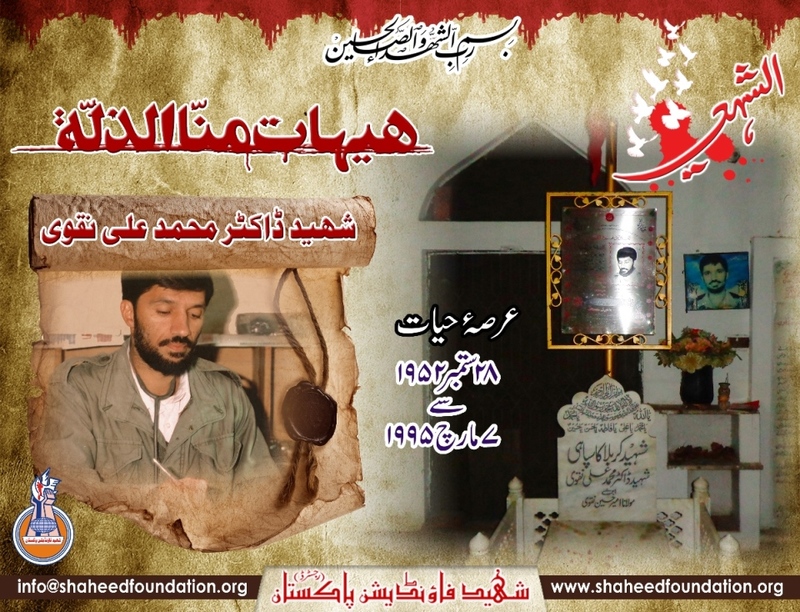 7th March: Shahadat Anniversary Shaheed Dr. Mohammad Ali Naqvi. Shaheed Dr. Muhammad Ali Naqvi, Founder of several Shia organizations in Pakistan including Imamia Students Organization (ISO), Tehreek-e-Jaffaria, Imamia Organization, and others, was born on 28 September 1952 at area Ali Raza Abad (Nawab Sahab), then in suburbs of Lahore, Pakistan. Besides his father, Maulana Syed Amir Hussain Naqvi, who made the conscious decision of leaving government service & proceeding for religious education to holy city of Najaf. He was blessed to have Mohsin-e-Millat Allama Syed Safdar Hussain Najafi as a paternal uncle. Dr. Naqvi's early years were spent in the pious atmosphere of Najaf and Karbala, perhaps a reason why he vehemently responded to "Hal min Nasirin ..." throughout his later life. He then lived in East Africa where his father was a preacher. He did his Senior Cambridge (O Levels) in 1969 from Kampala (Uganda). He was an exemplary scout and an excellent debater during his school days. He then came to Pakistan to do his F Sc. from Government College, Lahore. It was here that he founded the Young Shia Students Association in 1969, a first effort of Shaheed Dr Mohammad Ali Naqvi to gather the Shia students in one Platform. In 1972 he was admitted to King Edward Medical College, Lahore. In 1972 he, along with some other students from other fields of study, was instrumental in converting an already existing Shia Students Association (SSA) into the now well-known Imamia Students Organization (ISO). He got fame as a student leader as he founded the 1st ever platform for Shi'a Students of Pakistan the Imamia Students Organization (ISO), the only Shia Students Organization in Pakistan. After completing his education, he was again among the founder members of Tehrik-e Nifaz-e Fiqah-e Jafria under the leadership of Mufti Jaffer Hussain on 13 April 1979 to unite the scattered Shia community of Pakistan in a one platform. Later, he remained the most loyal follower of Shaheed Quaid Allama Arif al-Hussaini and carried forward his mission almost single-handedly after the Shahed Quaid left us on 5 August 1988. Dr. Naqvi's wish for martyrdom was accepted by Allah on 7 March 1995 when he, along with his loyal body guard Taqi Haider, were going to Shaikh Zayed Medical Complex where he was employed. American Agents in Pakistan affiliated with a outlawed terrorist organization opened fired on his jeep at Yateem Khana Chowk, Multan Road Lahore. In this incident his gunman and driver Shaheed Taqi was martyred as he tried hard to save the main leader of Pakistani Shia community, presenting himself as a human shield of Dr Mohammad Ali Naqvi. Later Shaheed Muhammad Ali Naqvi who was severely injured, was transferred to hospital but unfortunately he could not survive. He was a strict follower of Khat-e-Khomeini (Path of Imam Khomeini, the founder of Islamic Revolution). In other words, he was a follower of real teachings of Islam (ISLAM-e-NAAB-e-MUHAMMADI). This was the honor of Shaheed Dr Mohammad Ali Naqvi that he was the first person in Pakistan, who chanted the slogans of Down with USA (America Murdabad) in Pakistan following the teachings of Imam Khomeni (RA). Dr. Naqvi was a true Islamic leader who in his whole life fought for the cause of Islam and Muslims. He was of a high caliber social figure that spent his maximum time for the uplift of illiterate and weak persons. For this purpose he set up many free schools at remote areas to facilitate the poor and downtrodden. He will not be forgotten as great leaders are remembered because of their good deeds forever. Let us resolve to repay the debt of his shahadat by trying to follow the path of this great martyr in service of Islam and Pakistan .